Situated at the southern tip if Sarena Kecil Island is this spot which upon first impressions does not look like much. However with the majority of Lembeh's dive spots a keep eye and patience is the key for scattered amongst the rubble and small coral heads are myriad macro critters, hence the name! 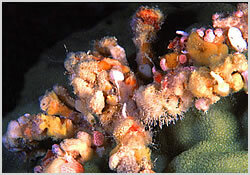 Keep a look out for decorator crabs, waspfish, frogfish and squat lobsters.